Many of us like to keep a clean house, but have you thought about keeping a clean garage… door? You know it would look better clean. 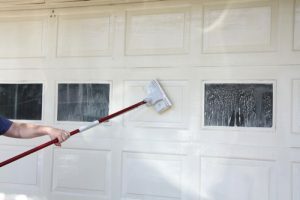 A lot of us just do not think about keeping our garage door clean, though and that is actually a problem. Why? Because a dirty garage door wears down faster. Yes, it will rust faster and no one wants a hole in their garage door. However, mold and other corrosive substances also make your garage door weigh a little more. It is just a little so it doesn’t matter, right? Wrong! That extra weight is then more than your garage door tracks, garage door rollers or springs and garage door opener is meant to handle. This obviously means you need to do something about it. Hence, Clarks Garage Door & Gate Repair has a guide to cleaning your garage door. Oddly, the first item you will need is a simple one; A bucket. A five-gallon bucket would work nicely. If you don’t have one you can get one from your local hardware store or retail giant. Then you will need some bleach. This can be in the form of liquid or a powder cleaner. Finally, you will need a scrubby of sorts. A sponge with a rough side will work nicely. It might not be wise to use a steel wool pad as that can take the paint completely off your garage door. You can also use a semi-soft brush with a handle, which might be a little easier. Also, be sure to wear a pair of gloves, either leather or latex. Once you have all of your garage door cleaning materials, fill the (five gallon) bucket up halfway and put those gloves on. Then pour in about half a cup of bleach. That might seem like a small amount but it is important not to overdo it with the bleach. Of course, if you are not comfortable using bleach, there are a few substitutes. Dish soap will work, just not as well. Multi-purpose cleaner (without bleach) also works, but again, not as well. Now you are ready to clean that garage door! Make sure you get every panel and every crack and crevice. It is usually better to do the top first and work your way over from one side to the other. Then you can do the same thing for the bottom. Make sure to put some elbow grease into it and get any spots of mold or mildew off. 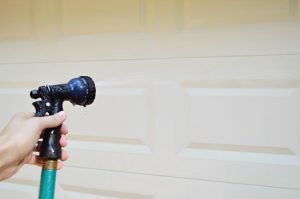 Once the garage door is entirely scrubbed down, you can rinse it off with the hose or just by filling up the bucket a few times. As always, if you have any questions or notice you need some garage door repair services, just call Clarks Garage Door & Gate Repair from anywhere in Los Angeles at (213) 769-1370. We are more than happy to help with any garage door problems you may have! How Much Does It Really Cost To Add A Garage To Your Home?